Present Status: Discontinued, but still in limited production for sale to US allies and use in non-military applications. Production will cease once Blue Types are fully decommissioned from active ACTF service and replaces the Red Type in commerce with US allies and non-military applications. 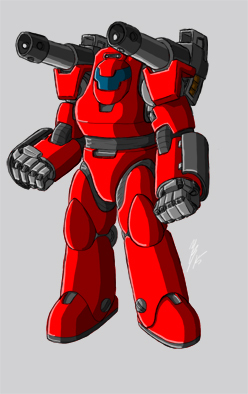 Description: The Red Type Cybernetic Battle Armor was the first mass production battle armor to be used against Chronos. Basically a cybernetic armored exo-suit that transformed a human soldier into a one man army, the Red Type battle armor provided comparable strength and durability to the typical mass produced Zoanoid types, that allowed a normal human to stand against the Superior forces of Chronos. Historical Note: Designed by Dr. Drake, the cybernetic battle armor was conceived nearly ten years ago, to be used in outerspace. In 1998, when we first discovered the threat of Chronos, Dr. Drake was asked if his designs could be adapted for use against Chronos. The Red Type battle armor was the result. Present estimates of the Red Types abilities have been compiled and summarized below. -Physical strength has been approximated to be equal to between ten and fifteen men and has been shown to be able to stand up to even the Gregole type Zoanoid. -Speed: The Red Type battle armor significantly reduces the users mobility due to several factors including slow reacting hydraulic musculature and weight of unit, due to the necessary tank like armor needed to protect users from Zoanoid attacks. This reduces the units top speed to a mere walking pace that does not exceed more than 5 or 6 MPH. Present non-military built version has been given a lighter steel armor plating that halves the units weight and allows unit to reach a maximum speed of 10 MPH. -Durability is roughly equal to Gregole due to the tank type armor plating. -Sensory perception: Armor is equiped with standard modern day military H.U.D. with both auditory and visual enhancers for night and long range targeting as well as allowing users to adapt to a wide range of combat conditions. 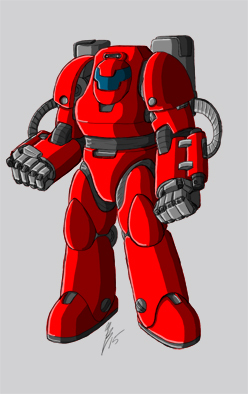 -Weapons: The Red Type battle armor is equipped with a single arm mounted electric gun that fires standard 20 mm H.E. rounds. Due to early mass production need of armor units to counter the superior power of even low level Zoanoids and to give our soldiers a fighting chance that no other armament could be integrated into this Armor type without increasing its already massive bulk. The present non-military built version of this model has replaced this weapon module with a socket that can be used to attach construction equipement such as a welder and/or bolt gun. -Special Note: Though this armor type has been phased out of active use by US military forces, the Red type armor was still being mass produced for use by rebel forces in other parts of the world, but is being phased out as Blue Types become available. -Some Red armors are being augmented with surplus Blue Armor parts and custom weaponry, though still not as powerful as a Blue type, it is hoped that the augmented Red armors will help oppose Chronos operations around the world.